Fifteen years have gone by since the last Yves Saint Laurent runway show at the Centre Pompidou and the closing of the couture house that bears his name. 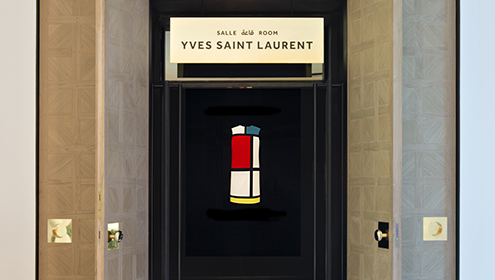 Fifteen years during which the couturier’s heritage has been preserved by the Fondation Pierre Bergé – Yves Saint Laurent, whose mission is to safeguard and share a unique collection: Yves Saint Laurent’s creative work. During forty years, Yves Saint Laurent developed a style that was his own. By accompanying the liberation of women, the many iconic garments he designed have become part of the history of the 20th century. The pea coat, trench coat, ‘smoking’, pantsuit and safari jacket became integral to a woman’s everyday wardrobe. At the same time, Yves Saint Laurent was the last of the grand couturiers who dominated the extraordinary epoch of haute couture. In his sublime evening dresses one sees references to painting, literature, the theatre and street fashion. The two museums bearing his name reveal he was indeed a great artist of his generation. 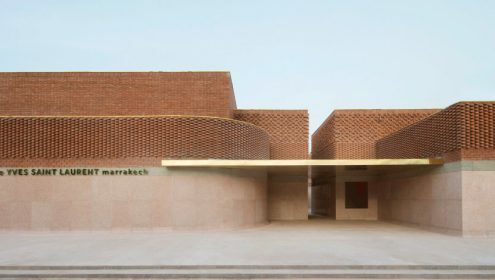 Located very near the Jardin Majorelle – acquired by Yves Saint Laurent and Pierre Bergé in 1980 – the musée YVES SAINT LAURENT marrakech occupies a new 4,000 m² building. It includes a 400m² permanent exhibition space devoted to the work of Yves Saint Laurent and designed by Christophe Martin. The museum also includes a hall for temporary exhibitions, a research library with over 5,000 volumes, a 140-seat auditorium, bookshop and terrace café. A real pioneer, Yves Saint Laurent was the only fashion designer of his generation to systematically archive his work, beginning with the founding of the couture house. The heritage safeguarded by the foundation is a treasure-trove allowing us to discover the creative universe of Yves Saint Laurent. A real pioneer, Yves Saint Laurent was the only fashion designer of his generation to systematically archive his work, beginning with the founding of the couture house. The heritage safeguarded by the foundation is a treasure-trove allowing us to discover the creative universe of Yves Saint Laurent. The Foundation’s holdings include more than 5,000 haute couture garments. The heart of the collection, enriched by ongoing acquisitions and donations, is based on the choices made by the couturier, season after season.The holdings include every entire haute couture collection made by Yves Saint Laurent between 1962 and 2002. The foundation also safeguards 65 Dior garments designed between 1955 and 1960 while Yves Saint Laurent was Christian Dior’s assistant, before becoming the couture house’s creative director.Aside from his haute couture collections and ready-to-wear clothing, Yves Saint Laurent’s creative genius was expressed in costumes he designed for renowned actors and actresses, among them: Arletty in Les Monstres sacrés (1966), Catherine Deneuve in Belle de Jour (1967), Anny Duperey in Stavisky (1974) and Geneviève Page in l’Aigle à deux têtes (1978). He was a close friend of the cabaret dancer Zizi Jeanmaire and the choreographer Roland Petit, for whom he designed many costumes and stage sets. 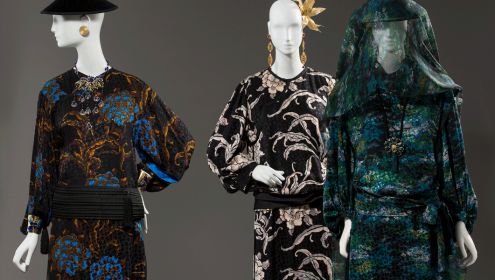 The foundation’s collection includes over a hundred costumes and dozens of accessories that bear witness to Yves Saint Laurent’s extraordinary talent when designing for the stage and screen. – The atelier worksheets feature reproductions of the original sketch along with useful information for the workshop, the name of the fashion model who would wear the garment at the runway show, material and colour references and swatches, the names of fabric suppliers, as well as a precise description of the accessories to be worn with the prototype when it is revealed to the public at the runway show. Any modifications made during the fashioning of the prototype are scrupulously noted. – The collection boards are large-format documents that provide an overall view of the collection. They are organised by garment type (for example, ‘Suits’, ‘Short evening dresses’, ‘Long evening dresses’, ‘Smoking’, etc.) and show a reproduction of the original sketch and the corresponding fabric swatch. The collection boards would allow Yves Saint Laurent to have an overall impression of the runway show from beginning to end, while giving him the opportunity to decide the order in which the garments would be shown, and verify that the collection was presented in a logical manner. Sourced from the couture house’s ateliers or press department, the archives provide us with a wealth of additional information concerning the prototypes and other garments held by the foundation. – The ateliers’ specifications sheets detailed the fabric yardage required, the cost of the fabric and other material needed to prepare the prototype, as well as the estimated time needed to fashion the garment; all this information was used to determine the price of the finished garment. – The patterns and canvas models were important elements used in preparing the final prototype, and served to refine embroidery samples, printed fabrics or plaited textiles used in the fashioning of hats and shoes. – The seating charts, press kits and invitations allow one to relive the most intense moments at the couture house as every runway show was being prepared. Above all, photographs and videos of the runway shows let us see the garments worn as the couturier imagined them. – The sales books and client sheets provide a detailed record of orders placed by the buyers and individual clients after each runway show. 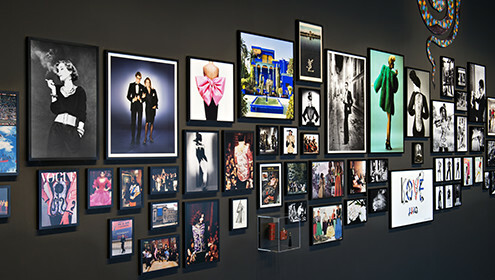 Yves Saint Laurent and Pierre Bergé’s personal archives – mostly photographs – are held by the foundation and allow us to retrace their lives beyond the couture house: their childhoods in Oran and on the Île d’Oléron, their early years in Paris, the amassing of their impressive art collection and time spent at their different homes. The Press and Communications Department at the couture house systematically archived magazines, press clippings and interviews. They provide invaluable commentary regarding the annual collections and other important events organised by the couture house over forty years. The archive greatly helps in understanding the career and life of the couturier, and places them in the context of the time. Important portraits of the couturier are held by the Fondation Pierre Bergé – Yves Saint Laurent, including one by Bernard Buffet, painted in 1958, and a series of portraits by Andy Warhol from 1972. The collection also includes more than 1000 vintage prints by some of the greatest fashion photographers of the 20th century: Irving Penn, Richard Avedon, Helmut Newton, David Seidner, Arthur Elgort, Jeanloup Sieff and Marc Riboud. Whether photographs commissioned by leading French and international newspapers and magazines, portraits of the couturier, or advertising photographs for the launch of perfumes, these images were instrumental in forging the history and prestige of Yves Saint Laurent and his couture house. The French architectural firm, founded and headed by Karl Fournier and Olivier Marty. They have overseen numerous residential and public projects in Morocco, Great Britain and the United States. While studying the couturier’s archives, Studio KO became intrigued by the duality between curved and straight lines, and between loose and precise approaches to cutting fabric. 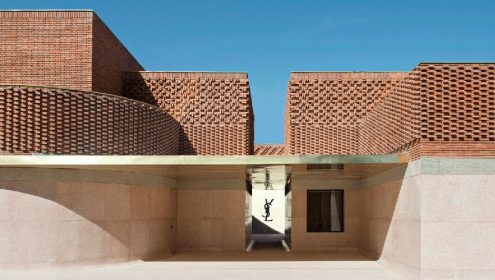 The facade of the building appears as an intersection of cubes with a lace-like covering of bricks, creating patterns that recall the weft and warp of fabric. As with the lining of a couture jacket, the interior is radically different: velvety, smooth and radiant. More than just a retrospective featuring the essential work of Yves Saint Laurent – the pea coat, the Mondrian dress, ‘le smoking’ and the safari jacket – the exhibition, rooted in Marrakech, is a voyage to the heart of what influenced the designer. 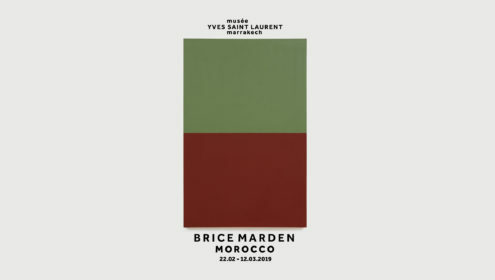 Fifty pieces chosen from the collection will be displayed around themes dear to Yves Saint Laurent – Masculine-Feminine, Black, Africa and Morocco, Imaginary Voyages, Gardens and Art – offering an original interpretation of the couturier’s work using garments that, until now, have rarely been seen by the public. The garments on display will be rotated regularly, in order to ensure their conservation and to constantly revive the exhibition. The museum scenographer Christophe Martin has highlighted the displayed pieces against a black and minimal background. The garments are seen alongside immersive audiovisual elements – sketches, photographs, runway shows, films, voices and music – that, by offering a sort of dialogue with the garments, reveal the couturier’s creative process and invite us into his world. It will welcome diverse exhibitions related to fashion, art, contemporary art and design, anthropology and botany. 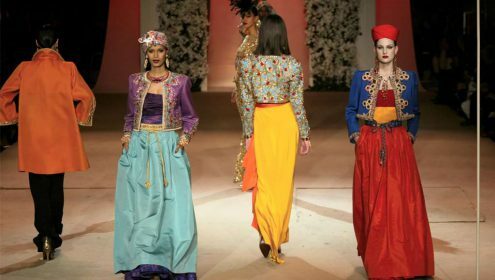 The museum will store important garments and accessories lent by the Fondation Pierre Bergé – Yves Saint Laurent in Paris, as well as non-exhibited pieces belonging to the Jardin Majorelle’s Berber Museum. 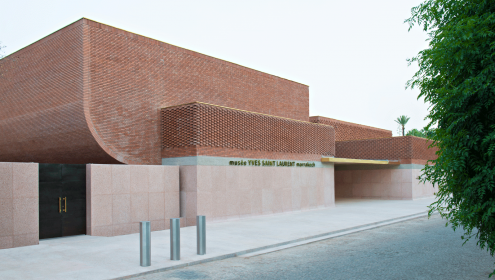 As is the case at the Fondation Pierre Bergé – Yves Saint Laurent in Paris, the mYSLm building conforms to a strict specifications brief that is the responsibility of Véronique Monier, a consultant in preventive conservation (X. Art). The entire building adheres to the most demanding preventive conservation norms employed by museums today. An elaborate technical system has been put in place to anticipate, prevent or hinder the natural deterioration or accidents that could age or damage the works. These norms guarantee that the pieces remain in an optimal state of conservation, and are tailored to create a controlled environment that takes into account the local climate. On 3 October 2017, more than fifteen years after the closing of the couture house, the Musée Yves Saint Laurent opened in Paris. It is located in the historic hôtel particulier at 5 Avenue Marceau where for nearly thirty years – from 1974 until 2002 – the couture house was headquartered. 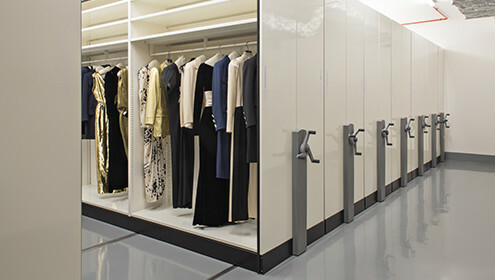 A 450 m² space is the setting for a retrospective display of Yves Saint Laurent’s work, alternating with theme-based temporary exhibitions; both will offer the public a view of the unique heritage conserved by the Fondation Pierre Bergé – Yves Saint Laurent. While visitors to the Musée Yves Saint Laurent Paris will better understand the couturier’s creative genius and the process involved in launching his haute couture collections, the institution is more than a monographic museum. It shows Yves Saint Laurent’s work as an essential component of the history of the 20th century, and offers a glimpse of the haute couture world that was very much part of a lifestyle that no longer exists. The museum scenographer Nathalie Crinière and the interior decorator Jacques Grange, who have worked on numerous projects for the foundation, were responsible for designing the exhibition rooms while remaining faithful to the original ambiance of the couture house. Dedicated to one of the twentieth century’s greatest fashion designers, the Musée Yves Saint Laurent Paris is the first museum of this scale – and devoted to a single couturier – to open in the capital of fashion.